Raised Copper Vessel, "Ginkgo Orb"
Raised copper orb, adorned with forged bronze Ginkgo leaves, and gilded with 23K gold leaf. Raised copper sculpture, hammer chased in the style of a conch or seashell. Interior gilded with 23K gold leaf. Approximately 6" wide x 4" tall. Additional images of this sculpture can be seen here. Raised copper orb, adorned with forged bronze Ginkgo Leaves and gilded with 23K gold. Raised Copper Bottle, "Copper Cascades"
Raised, necked, and chased copper bottle. Approximately 7" tall x 4.5" wide. Click here for additional images of this piece. Click here to inquire about price. 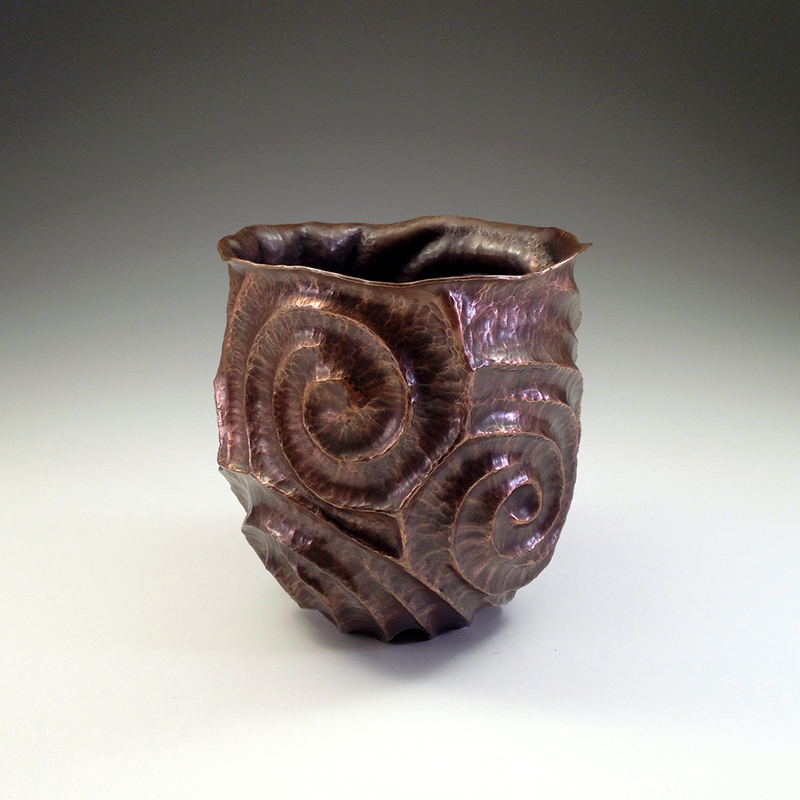 This copper vessel has been hammer chased in the style of a Nautilus Shell. The interior has been gilded with 23K gold. It is approximately 4" x 4". Raised copper sculpture, hammer chased in the style of a common garden snail. Interior gilded with 23K gold leaf. This copper orb is approximately 3" x 3". The interior is gilded with 23K gold leaf. 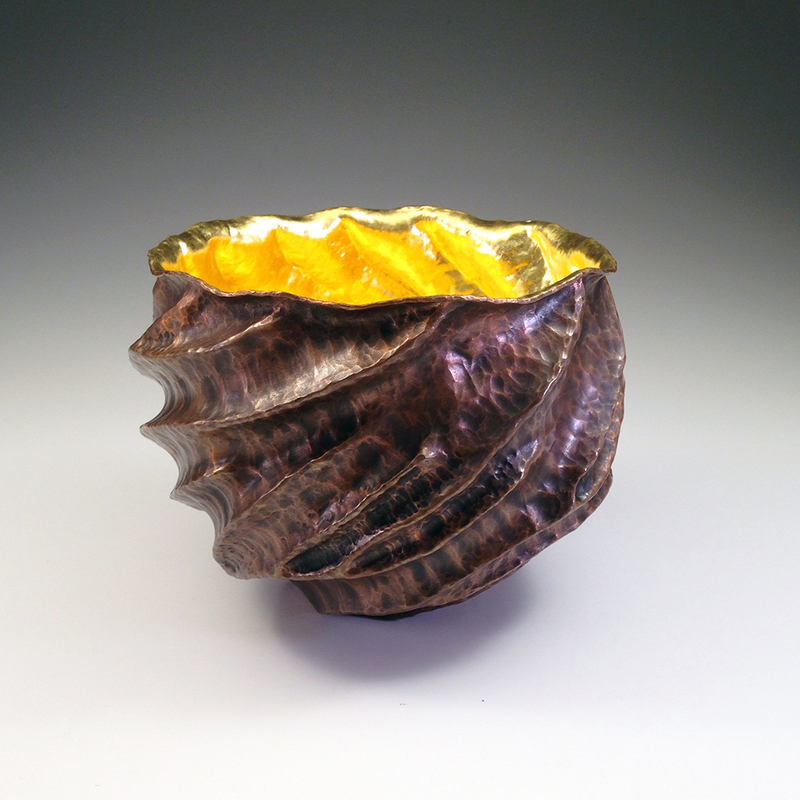 Raised Copper Vessel, "Of the Shore, Large Seashell"
Raised copper vessel, hammer chased in the style of a seashell, and gilded with 23K Gold. Raised Copper Bottle, "Simply Complicated"
Raised copper vessel, necked, and hammer chased into square angles. Raised Copper Bottle, "Copper Musings"
Raised and necked copper vessel. Raised copper vessel, hammer chased, and gilded with 23K Gold. 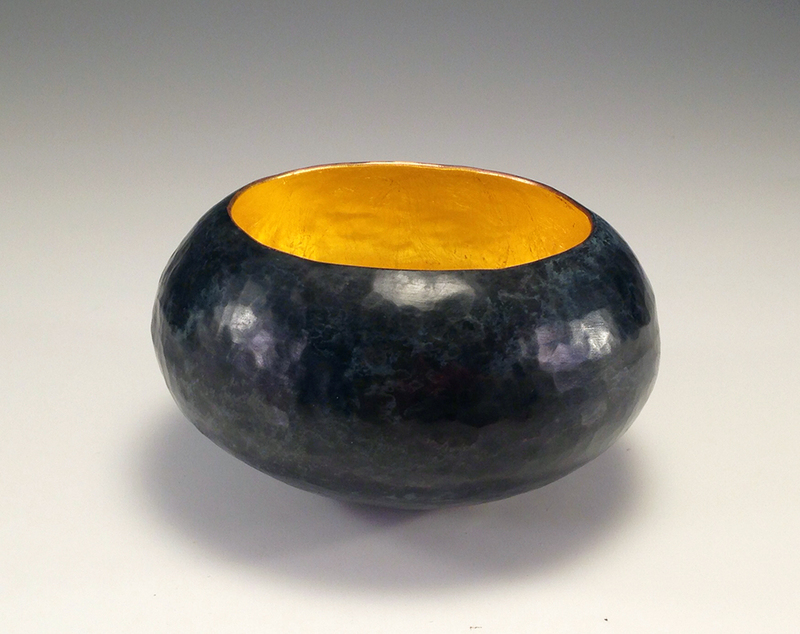 Raised Silver Vessel, "Silver Orb II"
Raised from .999 fine silver with a hammer planished surface and interior gilded with 23K gold leaf. Raised Silver Vessel, "Silver Orb I"
Raised Silver Bottle, "Silver Musings"
Raised .999 Fine Silver vessel, necked & hammer chased. 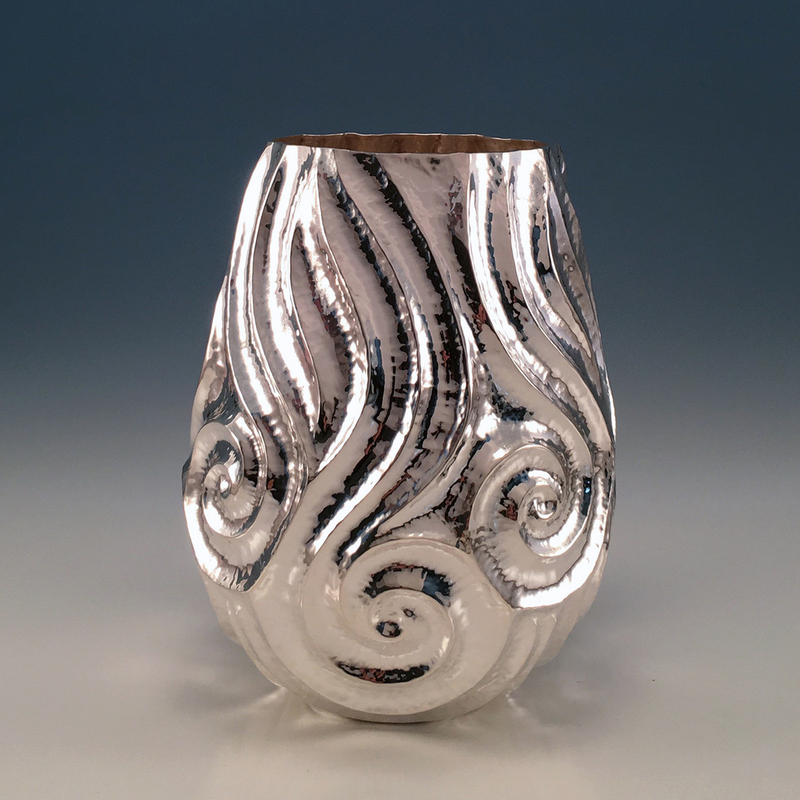 Raised Silver Vessel, "Silver Round I"
Raised from a single troy ounce silver round and hammer chased. Interior gilded with 23K gold leaf. 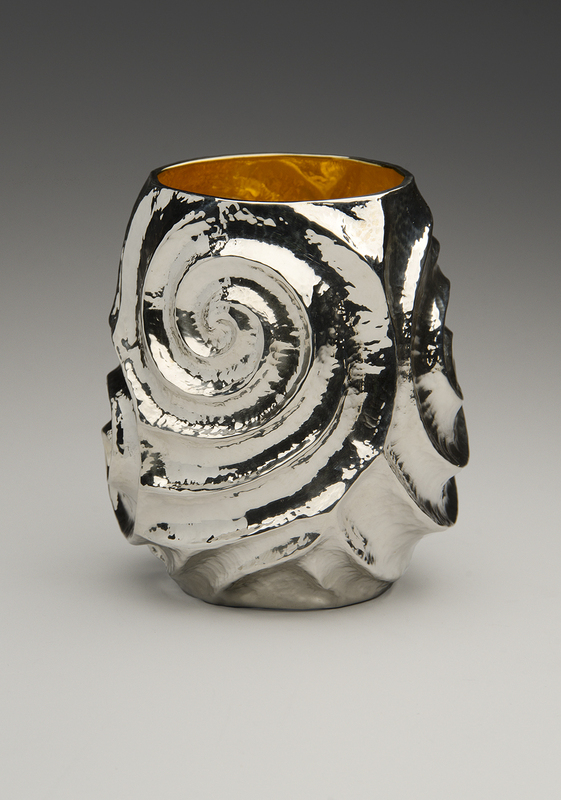 Raised Silver Vessel, "Textured Silver Orb"
Raised from .999 fine silver, hammer textured, and interior gilded with 23K gold leaf. Raised Copper Vessels, "Copper Orbs"
Raised copper orb with planished surface and interior gilded with 23K gold leaf. 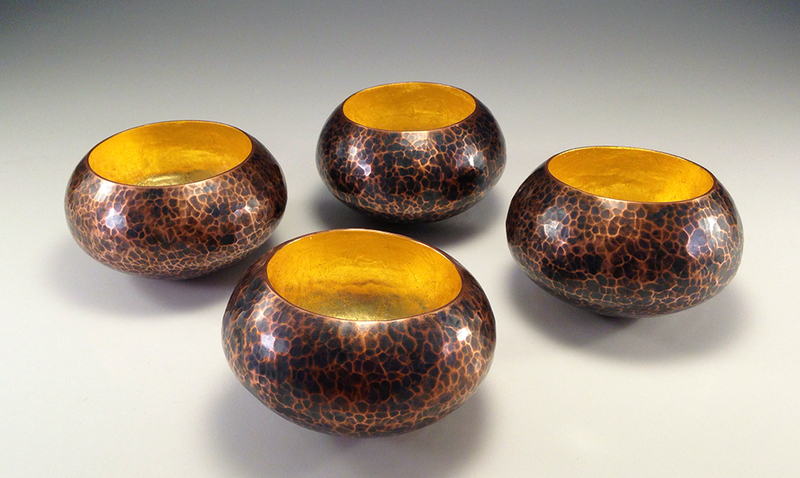 Raised Copper Vessel, "Copper Orbs"
A pairing of orbs; approximately 4"x4" and 3"x3"
Raised copper orbs with a hammer planished surface and gilded interior with 23K gold leaf. Raised Copper Sculpture, "Calla Lilies, Bouquet Vessel II"
Raised copper vessel with planished surface and interior gilded with 23K gold leaf. Hammer forged calla lily bouquet with bronze leaves and gilded stamen. Raised Copper Sculpture, "Calla Lilies, Bouquet Vessel I"
Raised Copper Vessel, "Quaking Aspen Orb"
Raised, hammer textured orb; adorned with forged Aspen leaves and gilded with 23K gold leaf. Raised Copper Sculpture, "Calla Lilies, Bouquet Vessel IV"
Raised Copper Sculpture, "Calla Lilies, Bouquet Vessel III"
Raised Copper Vessel, "Sandy Shoals"
Approximately 3.5" tall x 3" wide. Raised Copper Vessel, "Sandy Shoals Orb"
Raised copper orb, hammer chased, and gilded with 23K Gold. Raised Copper Sculpture, "Wildflowers, Bouquet Vessel V"
Raised copper vessel with planished surface and interior gilded with 23K gold leaf. Hammer forged wildflower bouquet with gilded berries and stamen. Raised Copper Vessel, "Nautilus Orb"
Raised copper orb, hammer chased in the style of a Nautilus Shell, and gilded with 23K Gold. Raised Copper Vessels, "Ginkgo Orbs"
Raised copper orbs adorned with forged bronze Ginkgo leaves. Gilded with 23K Gold. Raised Copper Vessel, "Ember Vessel"
Raised copper vessel, hammer chased. Bronze rim. Gilded with 23K Gold. Raised Copper Vessel, "Copper Orb with Patina"
Raised copper orb with torch fired patina and 23K gold. Raised Copper Vessel, "Hammer Textured Copper Orb"
Raised copper orb with hammer texture and 23K Gold. Raised copper vessel with 23K gold. Raised Copper Vessel, "Tree Stump Vase"
Raised Copper Vessel, "Tree Burl Vase"
Raised copper vessel, hammer chased, with 23K gold. Raised Copper Vessel, "Oak & Acorn Orb II"
Raised copper vessel, forged oak leaves, raised/hollow formed acorn, and 23K gold. 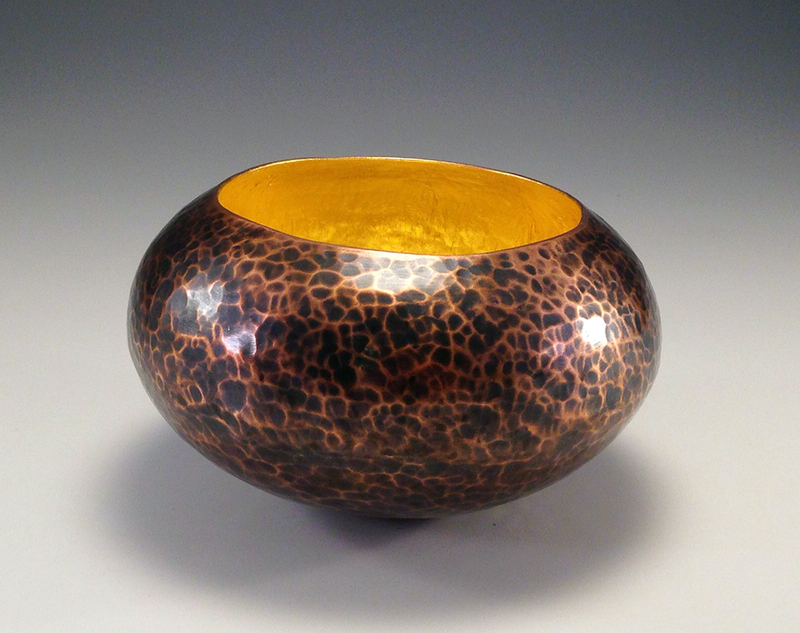 Raised Copper Vessel, "Old Growth Orb"
Raised, pierced copper vessel, hammer formed, with 23K gold. Raised Copper Vessel, "Copper Orb"
Raised Copper Vessel, "Tidal Pool Reflector I"
Raised copper vessel, hammer chased, torch-fired patina, with 23K gold. Raised Copper Vessel, "Tidal Pool Reflector II"
Raised Copper Vessel, "The Little Ocean Orb"
Raised Pewter Vessel, "Tidal Creature Orb I"
Raised pewter vessel, hammer formed, with 23K gold. Raised Pewter Vessel, "Tidal Creature Orb II"
Raised Copper Vessel, "A Place for Memory X"
Raised copper vessel, forged bronze ginkgo leaves, and 23K gold leaf. 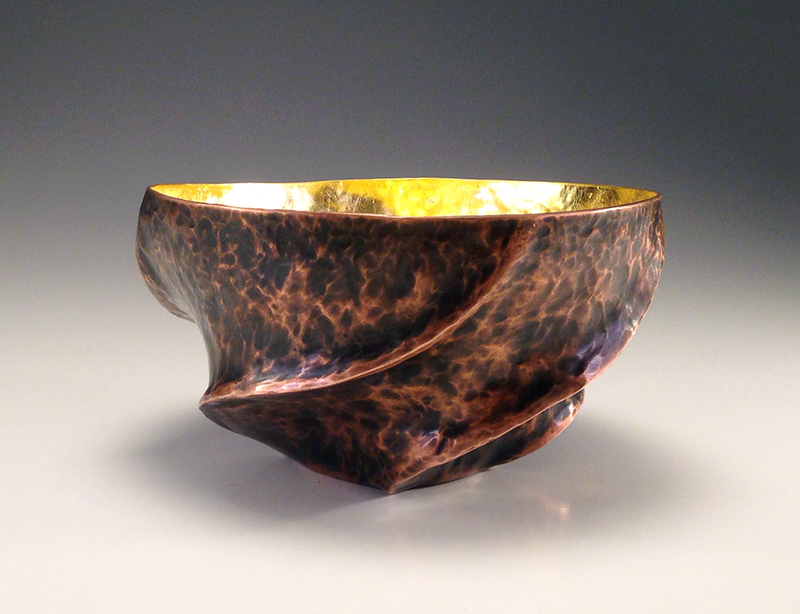 Raised Copper Vessel, "Burl Bowl"
Raised copper bowl, hammer chased & textured, 23K gold leaf. Raised Copper Vessels, "Copper Orbs w/ 23K Gold Leaf"
Raised copper orbs with 23K gold leaf. One orb pictured available for sale. Raised Copper Vessel, "Ginkgo Orb with Patina"
Raised copper orb, forged bronze ginkgo leaves, torch fired patina, and 23K gold leaf. Raised Copper Vessels, "Ginkgo Orbs I - IV with Patina"
Raised copper orbs, forged bronze ginkgo leaves, torch fired patina, and 23K gold leaf. Three orbs pictured available for sale. Raised copper vase, hammer chased and formed, 23K gold leaf. Raised Copper Vessel, "Mini Dancing Vase I"
Raised Copper Vessel, "Mini Dancing Vase II"
Raised copper vase, hammer chased & formed, 23K gold leaf. 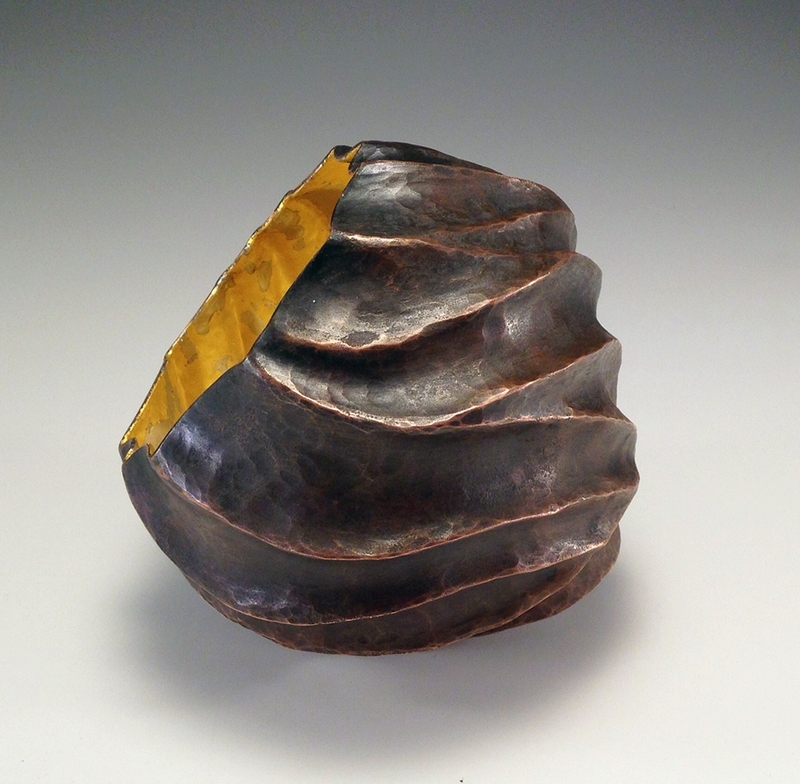 Raised Copper Vessel, "A Place for Memory XI"
Raised copper orb, forged bronze ginkgo leaves, 23K gold leaf. Raised Copper Vessel with Silver, "Calla Lily Orb II"
Raised copper orb, forged fine silver calla lily with copper stem and leaf, 23K gold leaf. Raised Copper Vessel with Silver, "Calla Lily Orb I"
Raised copper orb, forged fine silver calla lily with copper stem & leaf, 23K gold leaf. Raised, necked copper bottle. Hammer chased & textured. Raised copper orb, forged copper oak leaves and acorn, 23K gold leaf. Raised copper orb, forged copper branches, forged silver flowers, 23K gold leaf. 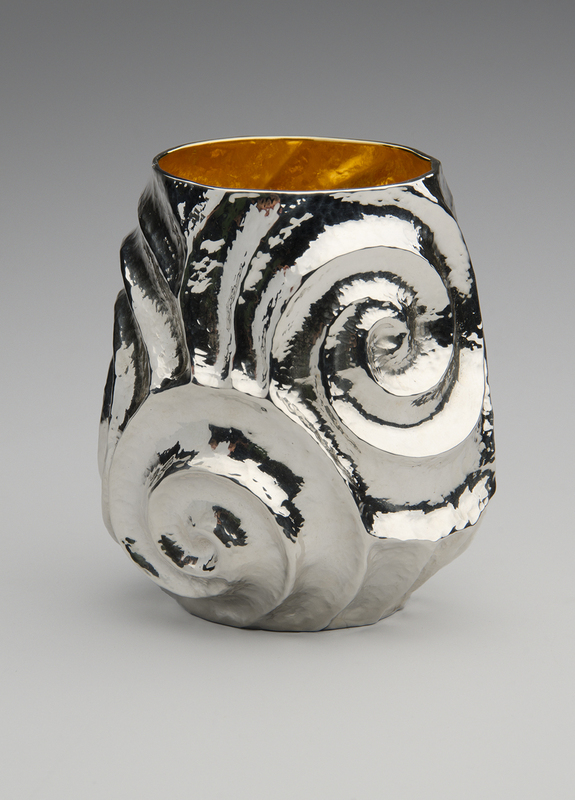 Raised Silver Vase, "Winter Tide"
Raised, hammer chased fine silver. Approximately 6.5" tall by 5.5" wide. Raised Copper Vessel, "The Dancing Vase II"
Raised copper vessel, hammer chased. Approximately 4.75" wide x 5.25" tall. 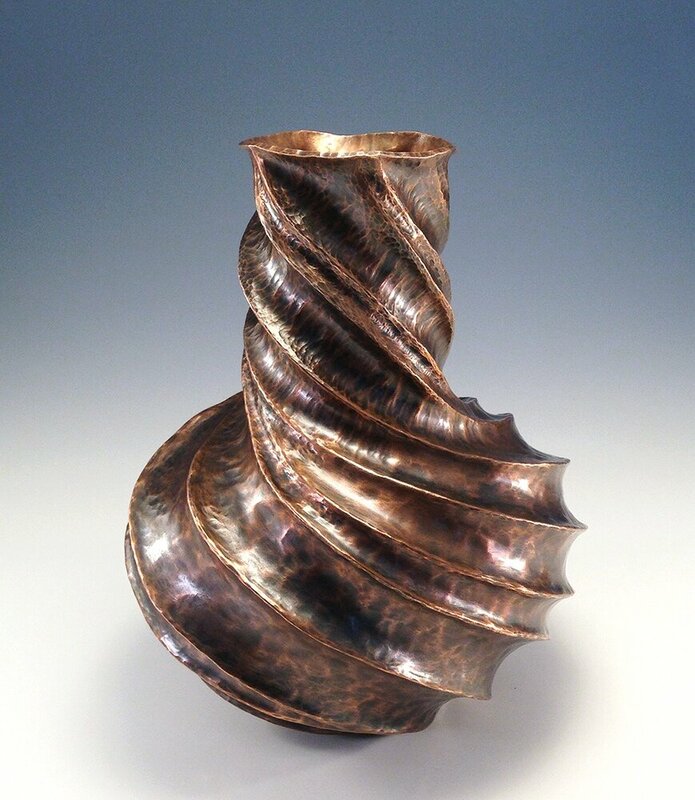 Raised Copper Vessel, "The Dancing Vase I"
Approximately 5.25" wide x 5" tall. Approximately 6.5" tall x 4" wide. Approximately 4" wide x 2" tall. Copper Vessels, "A Place for Memory"
Raised copper vessels with individually forged bronze ginkgo leaves. Torch fired patina / antiqued copper patina. Approximately 4.25" wide x 1.25" tall. "A Place for Memory IV, V, VI, VII, & VIII"
Raised/formed copper tidal form with 23K gold. Tidal Forms are irregular in shape and size. Maximum footprint is approximately 3" wide x 3" long. Maximum height is approximately 1.5". 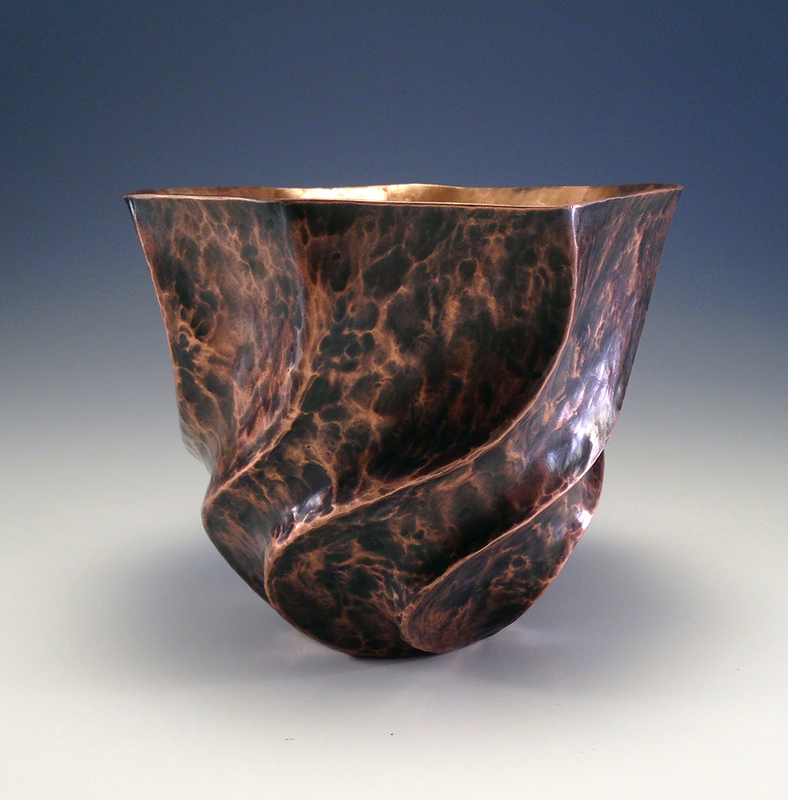 Raised/formed copper tidal form with forged bronze ginkgo. 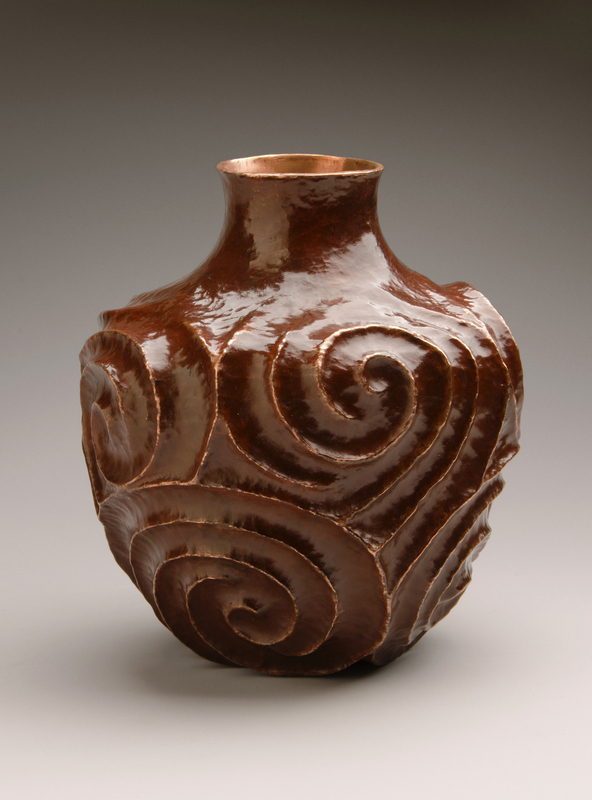 Raised & necked copper vessel. Commissioned piece in the style of Dervish. 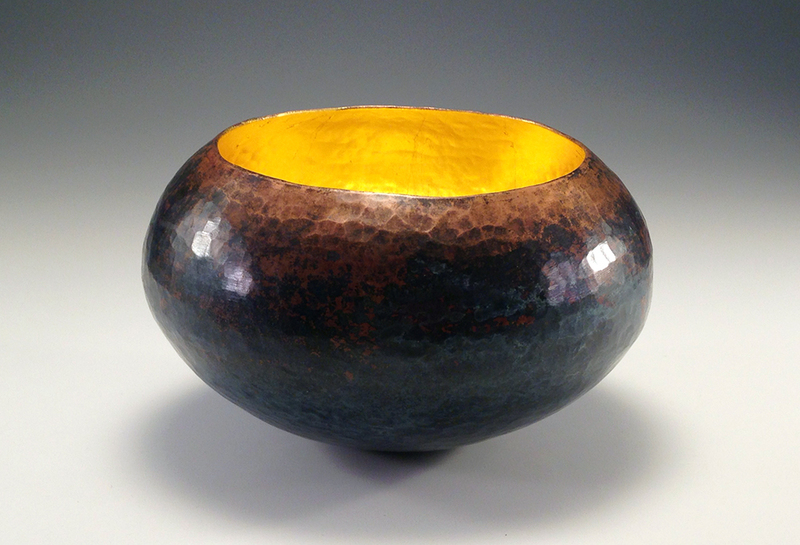 Raised copper vessel with 23K gold gilding. Approximately 5.25" wide x 2.75" tall. Copper Vessel, "Of the Caverns II"
Raised copper form, hammer chased. Gilded with 23K gold & broken palladium. Approximately 4" long x 3" wide. Raised copper vessel, gilded w/ 23K gold. Copper Vessel, "The Dancing Bottle"
Copper vessel, raised, necked, & hammer chased. Approximately 6.5" tall x 5.5" wide. Partial torch fired patina, partial antiqued copper patina. Copper Vessel, "The Dancing Bowl II"
Raised copper bowl, hammer chased, & gilded with 23K gold. Approximately 5" wide x 3" tall. Raised Silver Cup, "Of New Grange IV"
Raised Silver Cup, "Of New Grange II"
Raised Silver Vessel, "Of New Grange III"
Copper Vessel, "The Dancing Bowl"
Raised copper bowl, hammer chased, & gilded w/ 23K gold. 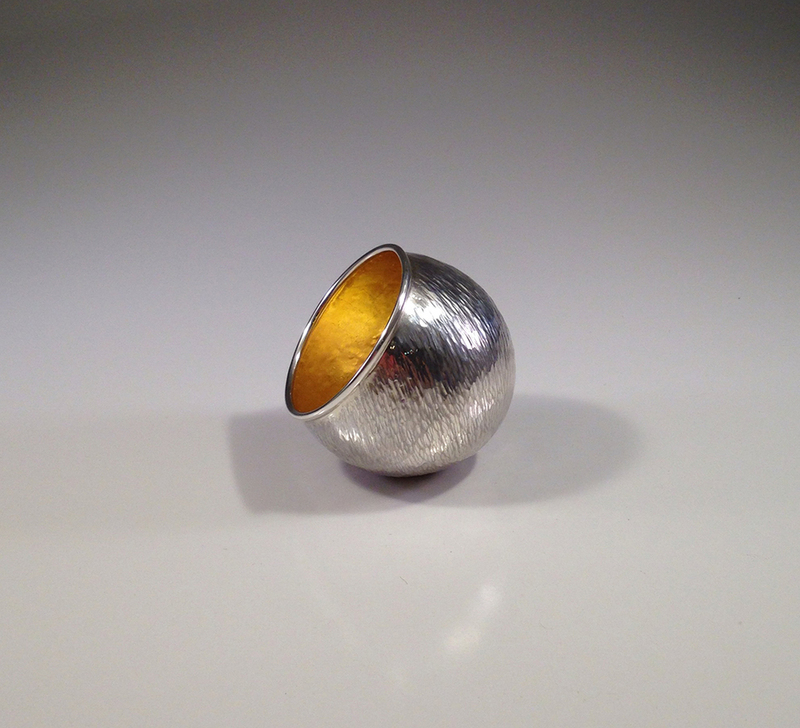 Raised .958 silver orb with sterling silver rim, hammer chased, and gilded w/ 23K gold. 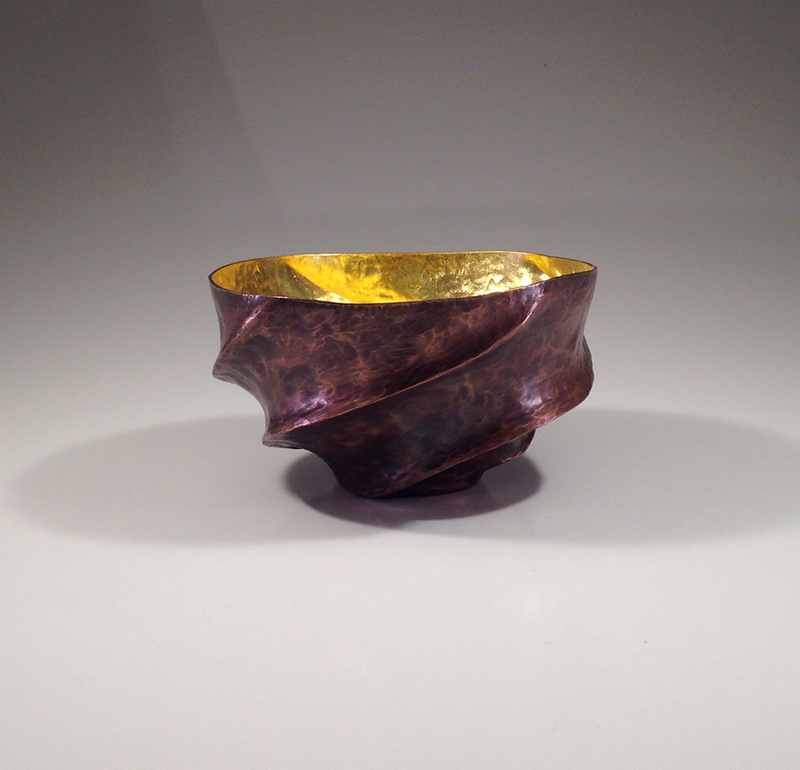 Raised Copper Vessel, "TanKin Bowl w/ 23K Gold"
Approximately 4" tall x 6.75" wide. Raised copper orb gilded w/ 23 K gold. Approximately 4.25" wide x 3.75" tall. Right & Left: Approximately 4" x 4". Center: Approximately 4.5" x 4.5". 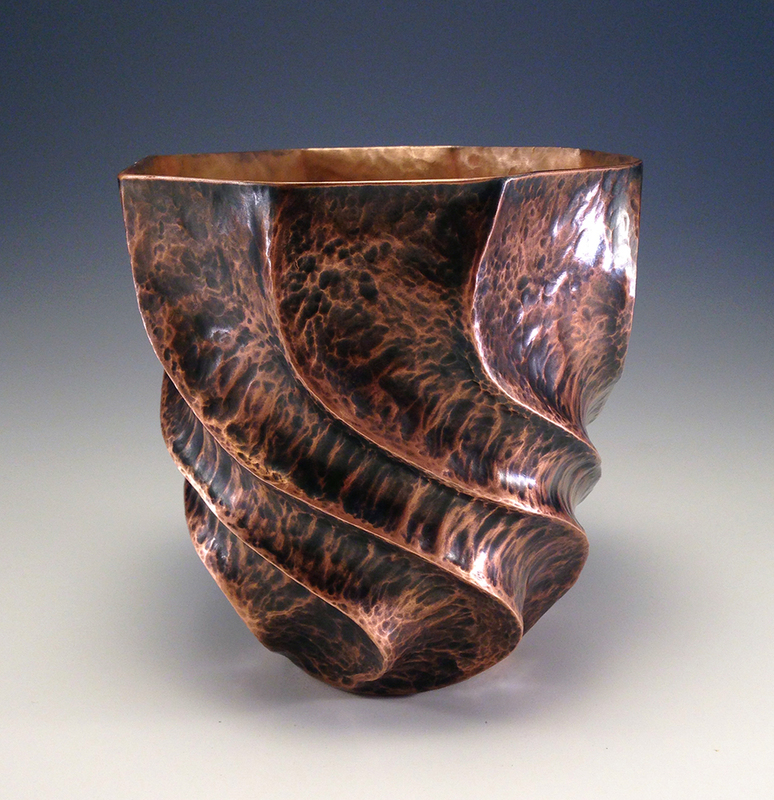 Copper Vessel, "Object from the Forest Floor"
Available for Sale - Price upon request. 18g copper, hand raised, chased. Gilded with 23K gold leaf. 12.5" long x 12" tall x 12" wide. Copper Vessel, "Of the Caverns I"
Raised copper vessel with sterling silver rim. Gilded with 23K gold. Torch fired patina. 18ga copper, raised, hammer chased. torch fired patina, wax finish. 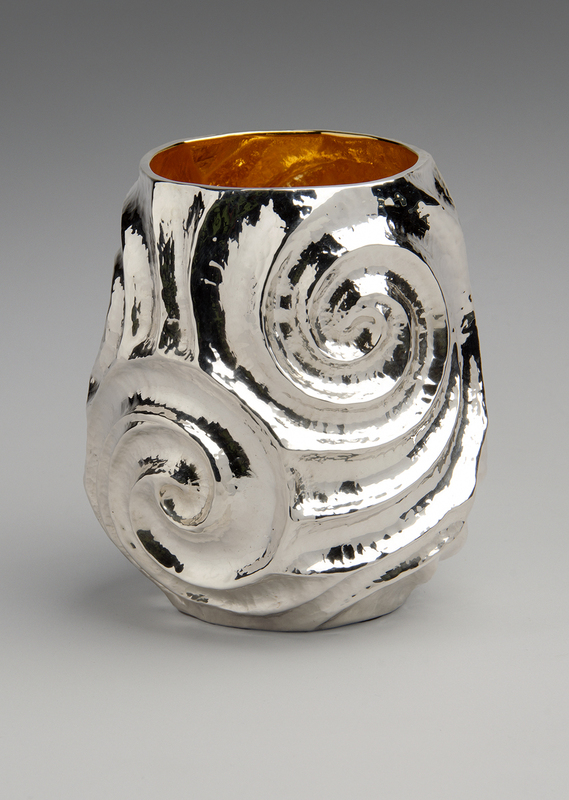 Silver Vessel, "Of New Grange"
.999 fine silver, hand raised, chased. 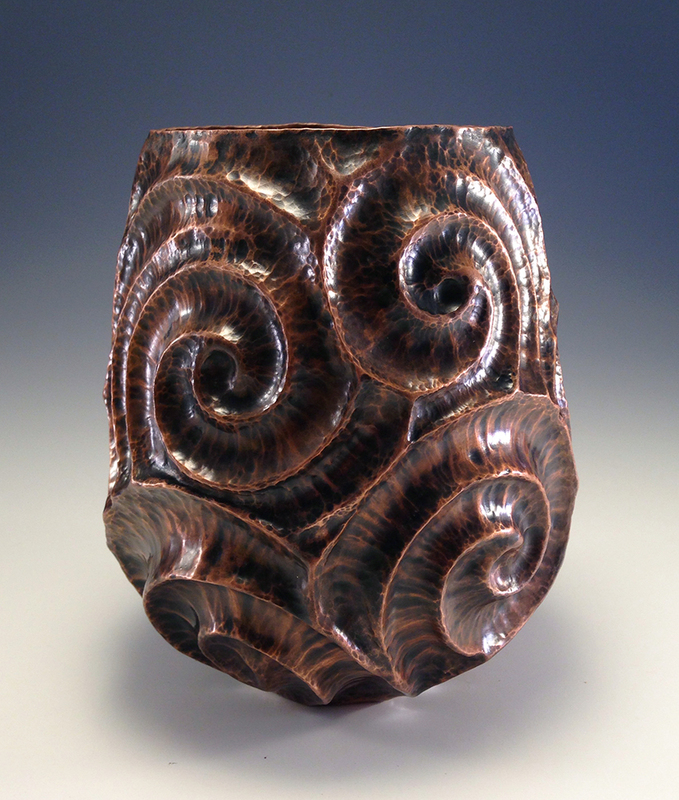 Copper vessel; raised, chased, w/ prismacolor patina. 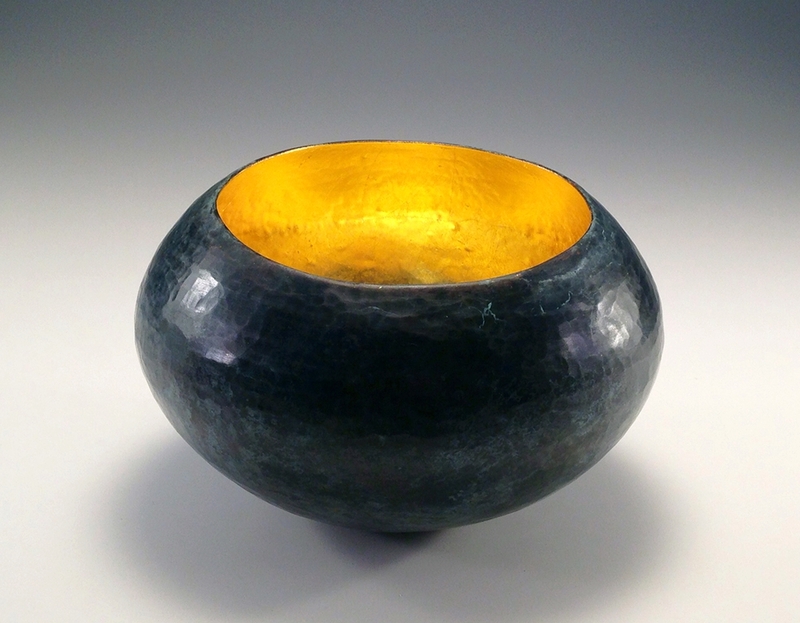 Copper Vessel, "From the Heart"
Yellow brass vessel; raised, snarled, & hammer chased. Copper Vessel, "From the Depths"